SnoopStick – Goodbye Privacy | OhGizmo! Once installed on a system you can then monitor that computer’s online activities anywhere in the world by simply plugging the SnoopStick into your own PC. You can see what websites have been visited, check who or where emails have been sent and even read IM conversations as they happen in real time. The SnoopStick will even store up to 12 months of activity logs if you don’t want to keep an eye on the other computer all the time or if you happen to need a bit of evidence later on. 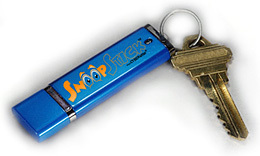 The SnoopStick is available from CYBERsitter for only $59.95. If this thing could pass firewalls…wow, that would really be frightening. But I suppose it cannot! I wonder how you monitor it… does it upload to a website? Or do you have access to the hard drive? Aka.. trojan…. interesting spy program though. Very interesting.